It's enough to turn you into a Socialist. WILL GOD MAKE A NATION GREAT AGAIN? Do you believe that you are the sum of your thoughts, knowledge and beliefs? That your identity is entirely dependent on those thoughts? If so, what happens when you change your mind, beliefs or knowledge? Are you the same person? Or do you believe that you’re a feeling, emotional being who happens to have thoughts and ideas? What happens if you don’t have an emotional reaction in a given moment or are stuck in depression? Who are you then? What does it mean if your emotional reactions are context-dependent? Are you still you? However, I don’t really like the binary nature of that scale. We all think. We all feel. Trouble is, we may not be very aware of the end of the spectrum that we are unfamiliar with. Ts are often unaware of their feelings and Fs are often unaware of the thoughts and beliefs underlying their feelings. This is where we get into trouble. Being in touch with both our thoughts and feelings help us to have a more complete understanding of who we are, how we feel, why we think what we think and why we feel what we feel. 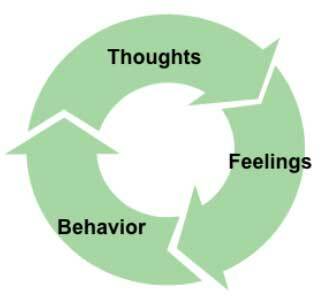 Our habits of thought, feeling and behavior that define our personality, in the end, are really just habits. We can break and change those habits, yet we’re still the same person underneath, aren’t we? I like the person you are – that combination of your hidden and portrayed self. It’s one of my gifts to see the best in others, including that hidden part of you. I also hope for your growth and improvement in your life’s satisfaction, sense of authenticity and empowerment. Changing habits that are maladaptive does not change who you are, it merely helps you be a better version of you. You can be happier, more peaceful, have better relationships, and improved health by taking a holistic and appreciative view of yourself and your world. All that being said, the question of Who am I? remains unanswered especially if you acknowledge that most of our thoughts, feelings and behaviors are malleable. I am not a theologian or philosopher, so I will leave that question to those wise scholars. As an applied positive psychology practitioner, I reflect on that T-F dynamic and how we can use that self-knowledge to create the best possible life. But I think I’m out of space. I feel I must finish this discussion in my next blog, Part 2: Thinking-Feeling Spectrum - Our Alien Brain. Perhaps the outcome of your thought-feeling dance will be for you to join me.